Despite ​West Ham pressure, Stoke took the lead in the second half, courtesy of Peter Crouch. 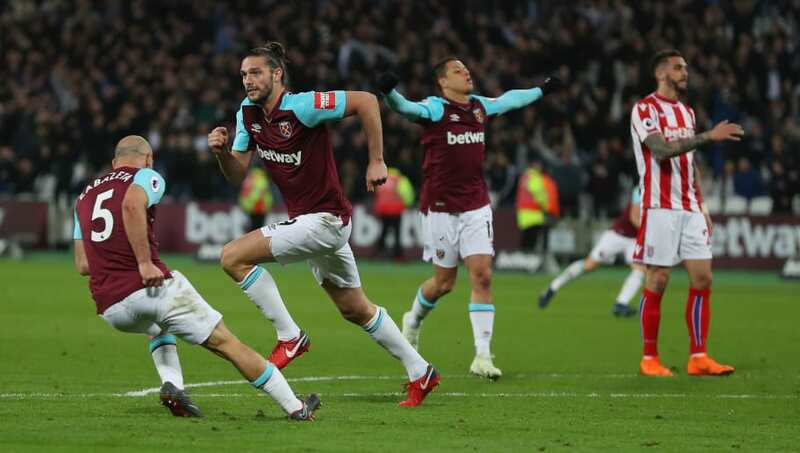 But the Hammers piled on the pressure and were rewarded when Andy Carroll was on hand to score past a helpless Jack Butland on the brink of injury time, denying Paul Lambert's side a potentially crucial victory in their battle against the drop. The first chance of the game fell to the hosts, with Arthur Masuaku's low drive well saved by ​Stoke keeper Butland. The visitors went up the other end seconds later, but Ramadan Sobhi should've done better with his chance, as his edge of the box strike was saved with relative ease by Joe Hart. Butland had to be alert to keep out Aaron Cresswell's free-kick as the Hammers looked to break the deadlock in the first half, but chances started to dry up. However, just after the half hour mark, Marko Arnautovic had a good chance to score against his former employers, firing his shot wide of the far post. The last chance of the half fell to the Hammers, but Mark Noble's tame shot wasn't a problem for Butland, and the keeper made sure the cagey first-half ended at 0-0. Stoke came out swinging in the second-half but as we've seen in past weeks, they would get very little luck. Xherdan Shaqiri found himself with the ball in the box early on after the break, but he couldn't quite find the pass across goal and West Ham were let off the hook. The hosts though thought they took the lead in ten minutes into the second half. Cresswell's cross found Arnautovic, and the Austrian converted from close-range - only for his hard work to be undone by the linesman, who had flagged for offside. The Austrian would see another goal ruled out by the flag moments later, after he was deemed to be interfering with place. Minutes before, Moritz Bauer squared the ball for Mame Diouf, but he couldn't keep his shot down, and he fluffed Paul Lambert's side's best chance of the game. However, with twelve minutes to play, veteran Crouch scored after Joe Hart spilt Shaqiri's initial shot. Crouch was on hand to tap-in from close range and put Stoke ahead in the encounter, giving them massive hope of a potential lifeline in their battle to keep hold of their ​Premier League status. But Stoke were defending very deep in the latter stages of the game, and West Ham were eventually rewarded for their pressure. The Potters failed to pick up Carroll as injury time approached, and he made Lambert's side pay as his strike found its way past Butland to give a sucker punch to Stoke. It was a draw which would've felt like a loss for the visitors, as they're now five points from safety, while the hosts have got a draw which all but confirms their status as a Premier League side for another season at least.  One change for the Potters against @WestHamUtd this evening, @KurtZouma replaces Glen Johnson in the starting line-up.